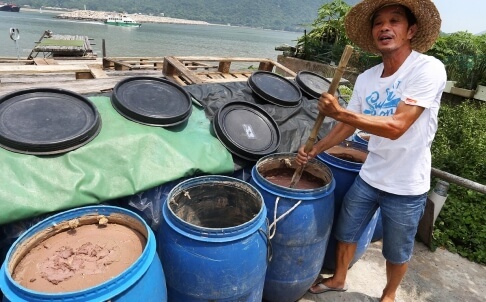 HF: The SCMP of 17th September 2014 contained an article about the demise of the shrimp paste industry in Tai O on Lantau island. 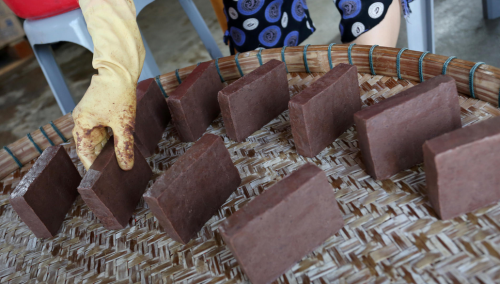 In particular it provides details about the Cheng Cheung Hing Shrimp Paste Factory and its owner Cheng Kai-Keung shown in the photo below. The company was founded by his great-grandfather in 1920. Production was badly affected by the banning of trawling in HK waters in 2013 which cut off supplies of local shrimp. As a result Cheng moved production to the Guandong cities of Yangjiang and Taishan leaving only final processing steps for himself and his wife at the family’s Tai O Factory.